A quick guide to searching e-Rocks for available items, saving searches and getting updates when items you are looking for are added to the site. Any other page or app posted online to other hosts will carry the search box.. Simply type in the mineral, locality or mineral and locality into the input box and click the "magnifier" icon or return on your keyboard. The e-Rocks search engine will then execute a search for available items with those terms, and order them in a results page with the most relevant matches first. The page of results will also contain expandible filters in the left hand margin and ordering tools at the top of the items. Note: If the search finds only one matched item, then the item page will open automatically. The website allows you to toggle results between a list or galley view. To change view mode click the red control button on the right hand of the screen. The rendered results show slightly different data, and options depending on whether items are available/sold or Auction/Buy Now. All pages have up to 30 items, with a pager for multiple pages. Simply click the page number or next link to tab through. When a search is executed successfully a page of results is returned if the number of matches is greater than one found. 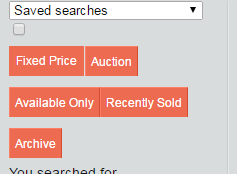 The results page looks like any auction page with the items shown in default order by "most relevant". At the top of the items panel is a drop down selector to let you order the results differently, for example Price High to Low. To re-order, the results click the down arrow to expand the list, then click the option you need. Once clicked the page will re-order according to the selection. You can repeat this as many times as you like and after changing the filter selection. What happens if the search returns no matches? If the search finds no results then you will see this message at the top of the results screen. You then can either dismiss this message and search again or go elsewhere on the site, or Click Here. When you Click Here, you have the option to save your search and we will send you an email every time a new matching item is added. To save a search you must be registered and logged in - a warning message will appear to remind you if this is not detected. When the option is selected you will see this pop up. For your convenience the save title will default to your search term, but this can be overwritten. If you do not want to receive emails, just uncheck the box. Click save and the options are committed. If by chance you have already saved your search with same name you will receive a warning screen with the options to change or overwrite your previous version. What happens if the search contains an exclusive term? Using the example "New Zealand", if this gets entered normally into the Search box, the search will go off and find all items with "New" and "Zealand" and present these by best match first. However if no matches are present items with New and/or Zealand will be shown. To make sure your search only looks for New Zealand or Cobaltoan Calcite, make sure you enclose the terms with inverted commas. What happens I want to search for more than one mineral? If you need to search and/or store a search for more than one mineral simply type in your minerals, and if you like, your locality keywords. The search will return everything containing those terms, in mineral, locality (and description) the best marches eg "Dioptase & Calcite" first. If you add "Tsumeb" into your search you will inject matches for this into the top of your results, eg you see Dioptase & Calcite from Tsumeb before anything else. 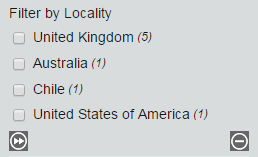 Note the locality search works on all levels - locality, region and country. As before the results page comes back with a list of filters to the left hand column. One a search has been initiated and results obtained we return our standard items page with items posted in a grid. In the Left Hand margin we display a range of filtering options these tailored to the data on the page. These are the red and pink buttons at the top of the Left Hand Filter Options. Depending on how a search results page has been created the number combination of buttons displayed will vary. The picture above shows all the availablity filters possible. To change an option click or tap the button you want to select. 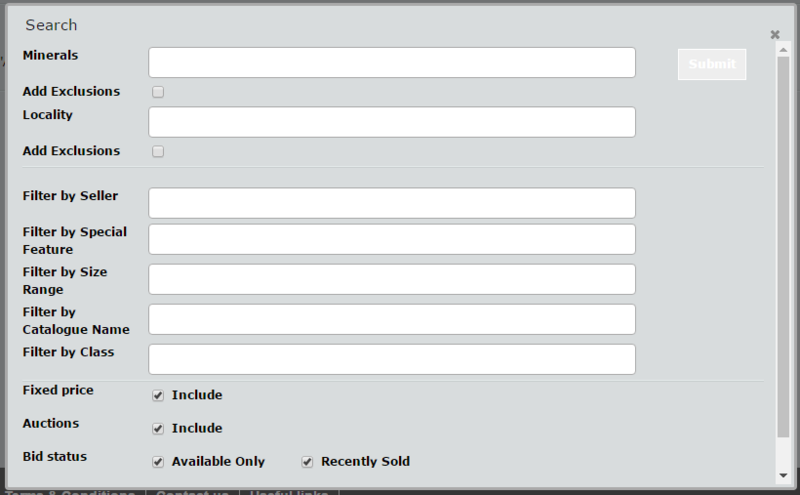 Near the centre of the panel is a list of available Properties filters displayed. Usually these are collapsed, unless in an auction then the active sellers is shown open. These filters relate to the properties of the items we describe in our listings, such as Size, Provenance, Specimen Type and indeed Seller. Shown within the list are filter options with a count of items found. To complete the filter check the box and click >>. If you want to drill down or explore further in Locality select and click as above and the filter will load, but the box state will also change to show the filter options on the selection. 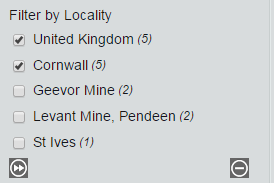 Here we have one option Cornwall with 5 items, to go further select the next level and click >> one more. This will take you to the lower level options in the hierachy. 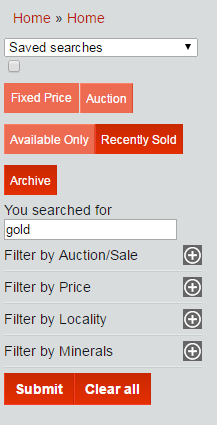 In some results pages the list of filters, for examples minerals on a 100 item auction may be enormous! In order to keep the panels trimmed and in view, we shorten the lists to show the first 40 items, with an expand option to expose the remaining options if required. Check the box and the list expands, uncheck and it contracts, if you have a selection it will remain selected. 1/ By selectively expanding the filter options and selecting then clicking >>. Each time you do this the results will adapt and the remaining filter options and counts will update. You can go back at any stage by unchecking a selection and clicking >> again. 2/ In one go by expanding the filter options and selecting the ones you want then clicking the red Submit button at the botton of the fliters. This will execute a page refresh based on the filter options selected. We recommend you actually use the progressive filtering as this will reduce the chance of selecting overlapping Nul values and getting no results. clicking the "Clear All" button at the bottom then "Submit" at the bottom of the filters menu. One important part of searching is managing your search options so that you can quickly find the items you want to see the most. The quick acess for your personal saved searches is given in the Saved Search Drop Down. Clicking the drop down opens the menu options for Saved Searches and lists out the titles of your current saved searches. Assuming you have created a page of item results with filters and sorting this option will let you bookmark this for later use. 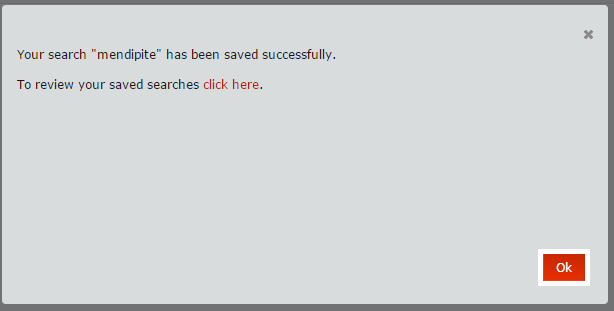 Clicking the option will take you through to the Save this Search dialogue. This option will take you to your list of saved searches stored in your profile. Within your saved searches you can view modify or delete your saved searches and email options all in one place. The remainder of this panel is devoted to your own list of saved searches by the title you have given. To call up a saved search, select and click the one you want and the search will run automatically. The default state of the Saved Searches drop down will display "Saved Searches" as an anchor, but if you run a Saved Search the default will update to the title of your search so that you know it is present. When you click back into the drop down, the recently run search will be on the top of the Saved Search list, below the e-Rocks default options. At the middle of the Left Hand Options Panel is a field labelled "You Searched For"
This field performs 2 functions. This field will hold the search terms entered as "Keywords" into our Search Engine to remind you of the starting point. If you have created a large results page or are in an auction, fixed price or archive page, you can key fresh Keywords to search again within your current results. Just key in the words and return. To go back just delete the words and return. Note: if overwritten the previous search term will not re-appear but the set of results will remain. If further searching does not reveal what you are looking for, then you will again have the option to save your search. To start open click or tap the icon. The Advanced Search appears as a large pop up box with the options displayed. The pop up (not shown to scale here) is divided into three sections. The search fields are separated into Mineral and Locality Search, to either work individually eg to search for Calcite, or Tsumeb on their own, or together eg Calcite from Tsumeb. 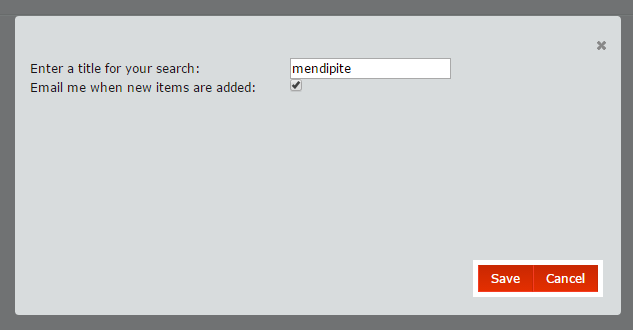 The search input is directly connected to the mineral and locality database, so that it will offer options as you type. The list of options will adapt as more letters are keyed in. If you want to submit a number of search options, keep the mineral or locality field selected and start a new look up by typing again. You can build a search for as few or as many minerals/locations as you like. Consider the scenario where you need to look up Calcite from United Kingdom, but do not want to see items from Cornwall. In this case you would select calcite in mineral and United Kingdom in locality, then check the exclude box beneath locality. When exclude is checked a new input will open and you can add the exclusion as above, by typing and selecting Cornwall. 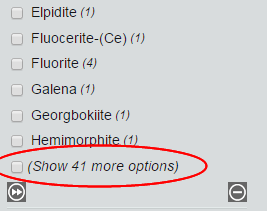 NOTE: This option works for combinations of minerals and localities and you can exclude multiple minerals and localities at the same. Once a valid mineral or locality is accepted the submit button is opened, showing red as above. This will remain open as you compile your search. Once the search is ready to be submitted, click or tap submit and the search will execute. If there are no matching items, you will be given the opportunity to save the search. If there are matching items a results page will appear with your search parameters displayed in the Left Hand column as filters. NOTE: There are no entries in the "you searched for" field as this is not a "keyword" search, instead your search parameters are shown in the filter selection. When a term is excluded it is struck out in the options. If you want to save this search go to the Save this Search option in the Saved Searches Drop Down. Additional filtering can be done using the available options in the Left Hand Filter options menu. The second section of the Advanced search box allows you to preselect the filter options used in the search. The list of options matches the data in item the description so allows you work within parameters you choose before entering the seach, rather than completing a search and filtering down. When a field is clicked or tapped you can type and the website will offer you the available filter terms to select. From here you can really focus a search, as the example below shows. The submit button will take you through to the search results. Further Properites filtering is available via the options in the Left Hand filter options. The third section of the Advanced search box allows you to stipulate the availablity of items you want to see, this also includes an archive search. This list of options allows you to switch things to match where and how you want to see things from our database. Further Availability filtering and be switched in and out via the red buttons in the Left Hand filter options. The Saved Searches panel lists all the searches you have stored in e-Rocks and allows you to search, view, modify or delete everything one place. The Saved Searches panel is resident in your user profile, therefore is only viewable when you are logged in. It is also personal to you and not viewable by anyone else. 3/ Via the My Profile option for Settings on your log in id, see User Profile help for this. The Saved Seach panel is a collapsible table in your User Profile/Settings, depending on how it was left in may be collapsed when you go to the page. NOTE: if you have not Saved Searches before saved this option will not show at all, until you have added something. To open this up click the > arrow by the Saved Searches title. The table will expand, to collapse again click the arrow the other way. The Saved Searches panel shows a table with all the current searches stored, it has a "quick search" at the top and relevant columns can be ordered up and down. This is a dynamic search on any fields listed in the table, simple type the search word letter by letter and the results will update as you go. To change the order of a particular column click the up and down arrow within the column heading. The selected option will show an arrow highlighted in red, also showing the ordering direction. This is a sequential number added to the Saved Search when it is created or updated, the higher the number, the more recent it is. The title is the name given to your search when it is saved. 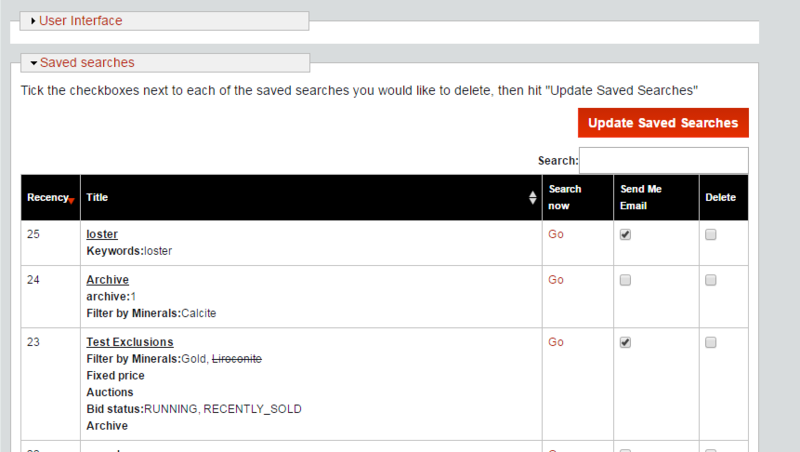 The title cell also contains the details of the stored search, these are listed according to any of the filters, and will include Seller Logos etc. All these terms are included in the table Search. To action any Saved Search select the row and click/tap the "Go" link next to the title you want to see. e-Rocks can notify you each time a new item is added to the site that matches your search. To switch this on or off check the email option column next to the desired search. NOTE: Changes to the email settings will not update until you click the Update Saved Searches button at the top of the table. How do I edit a Saved Search? To edit a Saved Search, select the search you need, click "Go" to run the search. When the search has run, make your changes via the Left Hand Filter Options. When complete select the "Save This Search" in the Saved Searches drop down. 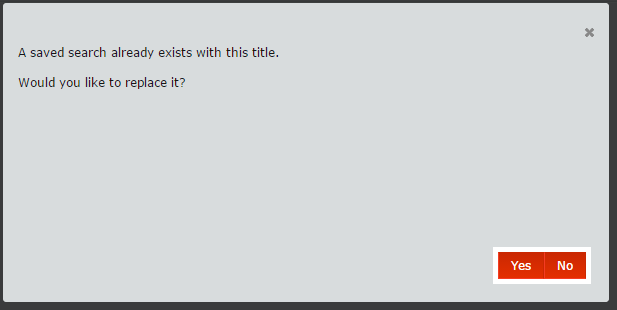 Then follow the instructions to either add a new title or update your existing selection.